Now!Board is a set of portable tools that work with any projector and computer to turn any flat surface into an interactive whiteboard. Quality and Effectiveness: With just a tiny camera (4” x 3.5” x 1.25”) that connects to any Mac or PC computer, the now!Board turns any surface into an interactive whiteboard. 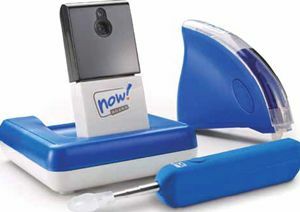 The now!Board comes with a USB camera, stylus, wand, software, user manual and quick-start guide, USB cable, all packed into a convenient and remarkably small carry case. The camera is designed to sit on any flat surface, or be ceiling-mounted, and its IR sensor tracks the movement of the stylus or wand. This means that the camera must have a clear view of the stylus or wand at all times, and that infrared devices, halogen lighting or low-hanging fixtures may interfere with the camera’s function. The stylus must be used on a smooth, non-marking surface and should not be used on walls or painted surfaces; the wand can be used on almost any surface, and does not even need to touch the surface to interact with the software. The now!Board can either display a work area or become invisible, which enables the user to write, draw, erase and type with an onscreen keyboard on any program or Web site. Unlike other interactive whiteboard programs, however, there are currently no shape tools, no built-in images or lessons. There are pen tools, options for colors and thicknesses of the pens, highlighter, and eraser for interacting with a page. Edited screens can be saved, or printed for future use. Ease of Use: Now!Board can be used with a projector on table, ceiling-mounted or with a TV/Monitor, so it can be set up virtually anywhere that a computer and projector can be set up. After setting up the projector between 5 and 11 feet from the display surface, (if using only the stylus, the projector can be up to 14 feet away) and powering up the computer and projector, the user plugs the now!Board camera into the computer with a supplied USB cord, and opens the now!Board software. The camera needs to sit about 12 inches behind the projector, but the display can be at any height, so that students can reach and interact easily. Each time the camera is connected or moved, it must be aligned, which can be problematic if it is not in a secure position. Alignment is quick, and the program instructs the user step by step through the process, and then it is ready to go. Creative Use of Technology: While it does not yet have all of the images, tools and lessons bundled into the software, the ability to interact with any program or Web site in almost any environment is a great advantage for any teacher who cannot add an interactive board to their room. It is much less expensive than a traditional interactive board, and can easily be transported in its handy carrying case. • Cost: The now!Board costs significantly less than other interactive board systems. • Versatility: Now!Board interactive technology can be used with existing technology, on almost any surface, to make any software, website or document more engaging and participatory. • Ease of use: Portable, simple to set up and to learn, the now!Board can fit into virtually any learning environment, and can be moved quickly and easily.